Hello wine lovers, it’s that time again! I am currently in frosty England so I thought I’d find a European wine to review – I did think about doing an English wine, but in the limited time I had available to shop, I failed to find any. So – what to choose – a classic Bordeaux, a cheeky Chianti? Nope – I went straight for the Rioja. These are damn expensive in Australia, but much more reasonable in the UK so as you can imagine, I haven’t gone overboard with the Rioja’s of late and I’ve kinda missed them. In fact, I was struggling to remember what they tasted like! Eeek! Seems like too good excuse to waste then, doesn’t it?So – Campo Viejo seems to be a bit of a ‘big brand’ wine – something of a large vinyard production – well, there’s nothing inherently wrong with that – it tends to mean a sharper price point and something more reliable quality wise. The bodega is not too far from the Spanish Pyrenees, an hours drive south of San Sebastian on the Ebro river – I realise now that I have, 20 years ago, driven within a few miles of this place on my way to do my geological mapping thesis. Yes, driven past without stopping. These days, Google maps would tell me that something interesting is a la derecha. Back then, I had no way of knowing. Anyways – Rioja – primarily from the Tempranilo grape for its rich deep heavy full bodied qualities, but it’s also commonly mixed with Carigan (Mazuelo) for some tannins and acidity and Graciano for complex ageing qualities and again full bodied strong flavours. So – how does this one score? Appearance: Surprisingly quite light in colour – its very translucent which is not what I expected for a full bodied wine like this. Its a rich even dark red colour – not too purple and not plummy. Aroma/Smell/Bouquet: rich ripe red fruit with some acidity and tang to it. Perhaps a little spice – hard to tell what though. It also smells a little ‘green’ – slightly hint of herbs perhaps. It’s not a wham bam than you ma’am in your face fruit burst, but an insistent very smooth hit. Nice. Taste: Very smooth. And light. Not what I expected – almost Pinot Noir in the softness here – what’s going on? Where my big red Rioja full body punch? It’s quite acidic – cheek puckeringly so – like the Cab Sav in a Bordeaux does. To be honest – it’s a little boring. I was expecting something complex and rich and it’s not at all. It’s not bad, far from it – I had this with some lamb and it was fantastic. Perhaps thats it’s secret – not being too overpowering but being an excellent companion to good food. Finish: More of the same – smooth with fading acidity. There’s something else too – a creamy slightly vanilla taste. I gave a little to my daughter (she’s 9 – its about time she got some lessons in how to taste wine!) – she picked that up too. It’s hard to describe, but it’s like a undertone of slightly sweet creamy brie. Very unusual and not at all unwelcome. After the slightly disappointing initial taste, this is good. Smooth and warm and creamy. It rounds off with a slight warmth of pepper from somewhere and leaves you with that creamy aftertaste that lasts for ages. Verdict: Its a shame the initial taste doesn’t have a bit more punch, as the rest is really rather good. I’d drink it with food – nothing too heavy though – lamb, cheese – it’d be perfect. It’s not as heavy as I had expected, but it’s soft Pinot like embrace is ok. Better than ok. Score – 7/10 – should have had a bit more ‘boom chikka wow wow’, but it’s really quite drinkable. Try something from the wine rack in the garage. Maybe we have a cheeky one more to your taste! I felt too guilty – can’t be stealing your wine!! 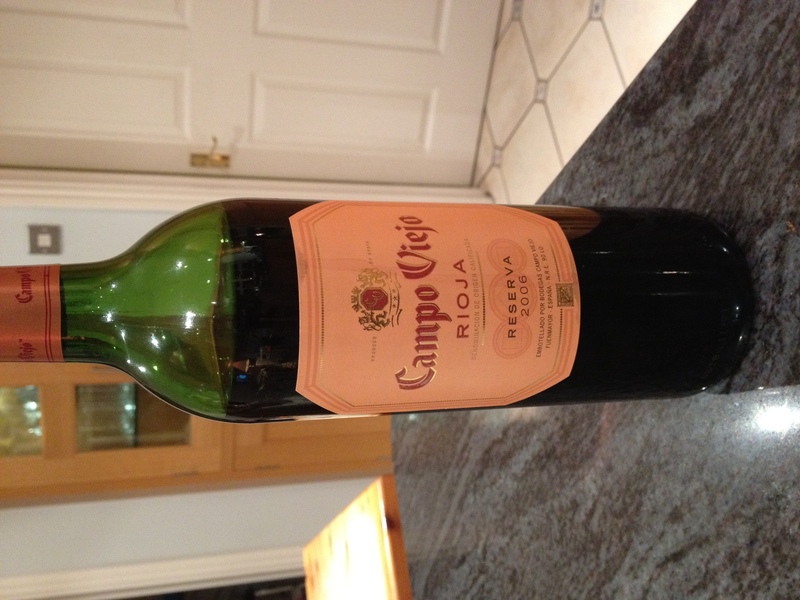 Although I appreciate pinot noir, I expect Rioja’s to pack more of a punch too – and when they do, Rioja is wonderful! I need to go to the bottleshop to see if I can find some ones with numbers! The only ones I can think of are the Penfolds Bin series – I’ll come over and comment!! Great … In the post I think I mentioned the Bin series, but didn’t list them … but the post gives you an idea what I was doing. Thanks.